The health of people around the world depends to a large extent on the ability of the global health community to predict what challenges must be met in the future. That was a theme of a major conference Monday and Tuesday hosted by the Vanderbilt Institute for Global Health (VIGH). 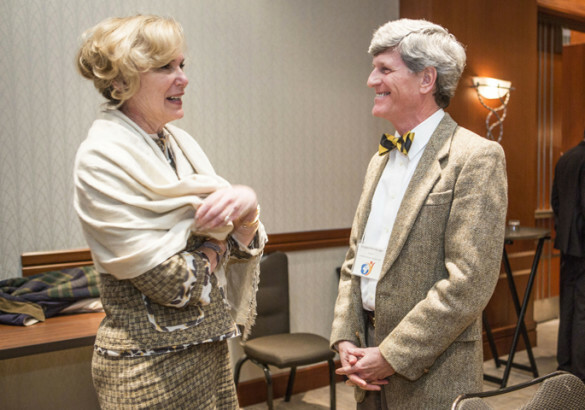 “It’s our job now to start asking the questions of tomorrow,” said Ambassador-at-Large Deborah Birx, M.D., U.S. Global AIDS Coordinator and U.S. Special Representative for Global Health Diplomacy, who spoke at the conference. Jennifer Pietenpol, Ph.D., Executive Vice President for Research at Vanderbilt University Medical Center and director of Vanderbilt-Ingram Cancer Center, who moderated a panel of officials from the National Institutes of Health (NIH), reinforced the theme of predicting what’s needed tomorrow. “Education is at the heart of it,” she said. Among the NIH panelists was Roger Glass, M.D., Ph.D., director of the Fogarty International Center, which has supported several global health training efforts at VIGH. An example is the multi-billion-dollar investment that the United States has made during the past 14 years in PEPFAR, the President’s Emergency Plan for AIDS Relief, begun under former President George W. Bush. Today, nearly 11.5 million people in sub-Saharan Africa are receiving life-supporting antiretroviral treatment, nearly 2 million babies have been born HIV-free and 222,000 new health care workers have been trained, according to the 2016 PEPFAR fact sheet. Vanderbilt has been a model, Birx said, not only in tackling the AIDS epidemic in very difficult parts of the world like Mozambique, but in partnering with community organizations and government officials to tackle the epidemic at home. Monday’s session ended with a tribute to outgoing VIGH director Sten Vermund, M.D., Ph.D., who will become dean of the Yale School of Public Health next month.